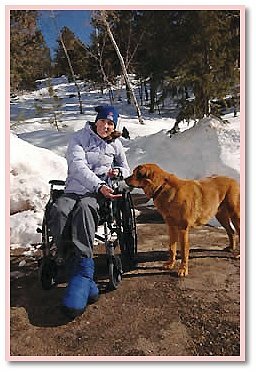 On a day in December, Golden Year 3 (2006), Danelle Ballengee, a two time world champion adventure racer was out for a trail run with her dog Taz in the high desert region of Moab, Utah, USA. She ran across some black ice and tumbled 60 feet down off the trail. She could not move because her pelvis was broken at the landing. Temperatures dropped to the sub-freezing degree of 20℉ (-6 ℃) that night. Luckily Taz, a Sheppard Mix that Danelle adopted from a shelter was with her. He cuddled up next to her and kept her warm. For 2 nights and 3 days out there, Taz faithfully guarded his friend. On the third day, Danelle was starting to loose a lot of blood and to loose consciousness. Taz sensed that it was urgent that she got some help. He started making runs from where they were to the main road where Danelle’s truck was parked down in the Canyon. He made several trips down there and then back to check on Danelle. Finally the Rescue Crews located the truck and spotted Taz. They were not sure if it was her dog or not and kept trying to catch him. But Taz wouldn’t let them; he just kept making them take one step after another, till they were led to the place where Danelle was lying. It was just the right time that the Rescue Crews got there before dark as it snowed that night and Danelle probably would not have survived another night because of the injury and the extreme cold temperatures. 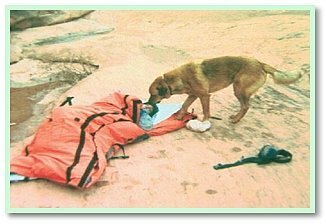 Taz displayed compassion, loyalty and remarkable intelligence during the rescue process because he has never received any form of rescue training. 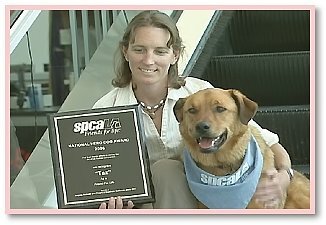 Taz was awarded the 25th National Hero Dog award by the Society for the Prevention of Cruelty to Animals – Los Angeles, in recognizing the strength of the human animal bond, because as Danelle said, “It’s amazing how loyal they are. You know, it’s amazing that they really do know more than we think they know. They’re willing to devote their life in order to save your life.